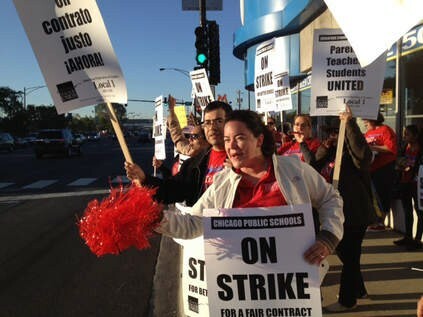 No sooner had the teachers called their strike than in came the calls, texts, and e-mails, running a little like this: Ha, ha, ha, ha, ha—you lost the bet! God, I can't stand gloaters—unless, of course, I'm doing the gloating. I was dumb enough to bet untold numbers of people that there would be no strike. At stake was lunch. If there's a strike, I pay. No strike, they pay. I made this bet with so many teachers that I'm almost starting to think they called the strike just to get a free lunch out of me. In my defense, I predicted no strike because I presumed that—this being an election year—President Obama would step in to keep Mayor Emanuel from doing something stupid to force one. I presumed this 'cause I thought the president wanted to get reelected. I also presumed that the president was smart enough to realize that it wasn't going to enhance his reelection by having his former chief of staff fighting with teachers in his hometown just weeks before the election. Just as it wasn't a good idea to let Mayor Emanuel host both the G8 and NATO summits in the same week. And the president came to his senses on that one. Look, I know the president was up to no good when he and the Daley brothers ushered Rahm in as our mayor. I've always assumed the president dumped Rahm on us because he couldn't take another day of him hanging around the White House. Moreover, I always figured that the president would just look the other way as Emanuel went about his business of cutting libraries, firing public employees, and closing mental health clinics in order to give more tax breaks and contracts to his corporate cronies. So long as it didn't mess up the president's reelection! Well, I think it's pretty clear that unless Mayor Emanuel comes to his senses, he's going to turn Chicago into this year's version of Wisconsin—a battleground for collective bargaining rights. The president certainly has no ideological stake in this showdown. The thorniest issue has to do with the mayor's insistence that he be allowed to link teachers' jobs and salaries to the standardized test scores of their students. Also, the mayor doesn't want to have to hire back teachers who get fired—for no fault of their own—when their schools get closed or turned around. Politically, there's no compelling reason for the president to back the mayor on either position—as their strongest proponents are privatization zealots, who wouldn't vote for Obama in a million years. And, of course, there's no educational value to them. They're largely linked to the fantasy that somehow we can close the gap in performance between rich and poor kids by firing "bad teachers." As though poverty, neighborhood crime, family issues, etc had nothing to do with student achievement. I doubt even Mitt Romney—in his heart of hearts—believes this stuff, although that won't stop him from trying to make political hay over the strike. Anyway, I was hoping one of the mayor's old White House pals—maybe Arne Duncan or David Axelrod—would call him on the phone and bring him back to Earth. But apparently they're as intimidated by Emanuel as your average alderman. I guess that leaves it up to Valerie Jarrett, the president's special adviser. From what I read she's not scared of Emanuel. So, Valerie, not to put pressure on you or anything, but get this dude to cut a deal with the teachers before it screws up the president's reelection big time. It’s the least the White House can do for sticking us with Rahm in the first place.